Dr. Kim obtained a combined undergraduate/medical degree at the University of Michigan, Ann Arbor, MI, through the Inteflex program. He undertook residency training at the Mallinckrodt Institute of Radiology at Washington University, St. Louis, MO, followed by a fellowship in abdominal imaging at Duke University Medical Center, Durham, NC. He spent five years at Mid-South Imaging and Therapeutics in Memphis, Tenn., prior to joining the abdominal division at the University of Wisconsin in 2005. He is the Vice Chair of Education and residency program director. 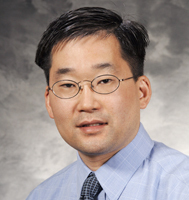 Dr. Kim's research interests primarily revolve around colorectal cancer screening by CT colonography and rectal cancer staging at MR.